Jon Sugihara’s resume consists of a mix of start-ups of just about every kind. 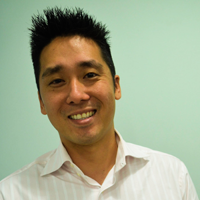 The past few years he has been in Singapore and founded Perx, the ultimate survivor of the ‘mobile loyalty wars’ a few years back; after Perx he joined Redmart, another startup albeit in a different order of magnitude; and now he has joined Kodakit, a startup-within-an-enterprise. We took the time to sit down with him one early morning, just before the start of the 2nd day of the InnovFest Unbound festival and asked him a few questions. Why did you join Kodakit in the first place? Kodakit is what you could call a corporate start-up. It is literally Kodak building on their heritage in photography and applying that to an Uber-like model that brings supply and demand in photography together. I have always been in start-ups but today there is the constraint of having a family. This limits me in my choices. Much like Redmart, Kodakit is a well funded start-up and at Kodakit I believe there is an enormous potential globally to make it successful. So ultimately I get the best of both worlds, not having to bootstrap with the dynamics of working in a start up. What is the difference with e.g. working at Redmart? At Redmart the landscape is much more complex. We had 35 products under development. Most people know the consumer app but I would call that just the top of the iceberg. There are also a lot of stakeholders that have to get involved in the product development. This makes it more challenging to build a roadmap. There was also the constant question of buying or building. Engineers and developers tend to want build stuff themselves but that is not always the fastest and best way forward. What is Kodakit and why has it such a confusing name? I know that some people think that Kodakit is the IT arm of Kodak. Internally we are talking about rebranding it but the idea was to create a verb like Google became. If you need any sort of media services, we want you to think to “KODAK it. Kodakit is not about access to a marketplace of photographers: it’s about the massively distributed and inconsistent workflow that kills businesses and photographers in today’s market. Kodakit removes the inefficiencies that exist between supply and demand in photography. For instance, think about real estate photography. It is hard to plan a photo session of a condo because you have to involve three parties; the owner or seller, the real estate agent and the photographer. On Kodakit the real estate agent can just post the date and time the owner is available and we’ll guarantee that a good photographer will show up, return the pictures way faster than anyone else and get the photographer paid in 7-14 days compared to the usual 45-90 days. We call that dynamic scheduling. Kodakit was started 9 months ago by Eric Mahe (Kodakit’s CEO) and Natasha Adams (CMO) when they were tasked by the new Kodak CEO Jeff Clark as part of a strategy to rejuvenate the brand. Photography is highly commoditised today but there is still a need for high quality images. Conservative numbers say that photography is still a 30B dollar business. What other areas of photography is Kodakit targeting? Every business we have spoken to has a user case where they felt their client workflow for photography is broken. Right now we focus on real estate, travel and product photography. Through the dynamic planning feature, an invoicing service, we can shorten the 4-5 weeks that companies currently take for photography and reduce it down to 2-3 days. That period means that they currently lose 20-25 days in your go-to-market process. Talking about go-to-market strategy, where is Kodakit today? We focus on Singapore and have signed up around 400 photographers so far. By the end of the year, we will be in a lot more countries. It is there where you see the advantage of Kodak being a global company. We don’t have to open offices and register businesses in all these cities. We are already there. We will focus on real estate and the travel industry. We let other areas such as food photography and weddings grow organically. In addition we will approach agencies to get them to use Kodakit for creative and product photography. What could put the success of Kodakit at risk? The risk might be in the fact that Kodak is 100% shareholder. Having access to a large company can be both a value and a disadvantage. We need to make sure we navigate this properly and figure out how to perform like a start up, while we have to try and take advantage of the resources from the parent company that a start up would not have access to. In terms of competitors there are a lot of local players but I don’t think there is anyone that focuses on this type of platform on a global level and that is where the big challenges for our competitors. The stock photography players like Shutterstock and Dreamstime allow you to join their community but do not specifically focus on the Uber part of supply and demand. You just started, what is your first impression? We have a small team of 7 people in Singapore and 4 engineers in Israel. I report to the CEO. So the setup is small and lean. I am focusing on the workflow right now. I want to make sure that onboarding and using the platform is as smooth as possible. How do you maintain quality? Won’t it be hard to ensure that clients are happy with the quality of the work of the photographers? Part of that will be checked during the onboarding. We will certainly develop and use algorithms to do automated testing. As a third check we will have reviews and feedback options for clients, like you have on Airbnb and Uber as well. Most professional photographers know perfectly well what is expected in the area of real estate photography e.g. so there will be a certain level of self-management when it comes to quality. In 5 years I hope to have a playbook from everything I have learned from this experience on how to innovate at larger companies. I think every large business in the world is trying to figure this out right now. This is a really huge problem and I really want to change the world when it comes to how all media is created and make this the go-to service. Kodak is I think well placed to make this a successful business. The brand name still creates trust and adds legitimacy to the platform. After all, almost anyone you speak to has had some sort of memory or relationship to the brand and that is extremely powerful. Powerful words, indeed. Will Kodakit become the Uber of photography? Watch this space.